Relax in one of our spacious ground floor rooms overlooking the gardens. 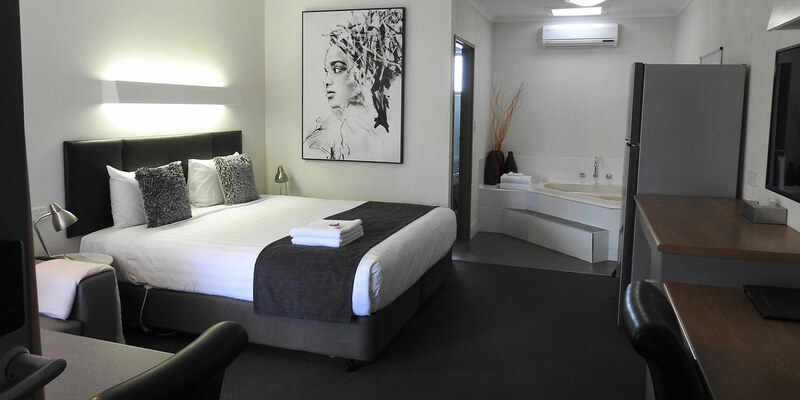 All rooms are non-smoking and are being constantly upgraded to maintain a high standard of quality and cleanliness. All 16 of Wine Village Motor Inn's rooms have fresh modern bathrooms with frameless glass shower screens separating the large shower from the bathroom*. All guest amenities are provided including, grooming kits, shower caps soap, shampoo and conditioner. Each room style offers it's own benefits and all have a breakfast table, work desk, large wardrobe, extra blankets and a range of pillows, because your comfort is important to us. Microwaves and Porta-cots can be placed into your room on request. * The Suites have framed corner showers and the Disabled Room has an oversized bathroom and shower curtain.